Now, I don't want to alarm anybody, but there's an energy crisis out there! Sure, I'd seen the Al Gore movie, I'd replaced my light bulbs with those CFL ones that don't turn on right away, and I'd eased up on the gas pedal a bit, but I figured since everyone's still driving those big, massive vehicles, how bad could it be, right? But, this latest development has me shaking in my boots (or ballet flats, whichever you prefer). Are you ready for it? 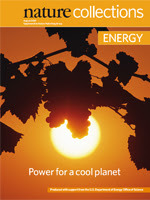 The journal Nature is offering a collection of articles on this whole energy issue....FREE OF CHARGE! For those of you who don't follow the cut-throat world of scientific journal pricing (what? You don't know any librarians?) Nature doesn't give away anything for free. In fact, just for typing the word "Nature" I'm sure they are sending us a bill right now (eh, I just went through the budget... we can afford another one...Nature). Oh wait, the free access to the collection is being supported by the U.S. Government's Department of Energy. That makes me feel a little bit calmer. In all seriousness, I haven't read every article but it looks like a pretty thorough collection. The most pressing technological problem facing the world is uncoupling the provision of energy from the net production of carbon dioxide. This collection outlines the promises and pitfalls of new energy technologies. It looks at the potential of biofuels and nuclear power, explores new ways to lock away CO2, and considers renewables such as solar and wind power. Wait a minute! The U.S. government wants us to have free access to information on the energy crisis?! I'll be hiding under my desk if you need me. Thanks for the heads up! Just ordered my copy! US Physics Olympiad Team Returns Victorious!